Via Lattea – A Resort for Everyone! Built by the owners of the Fiat car company in 1934 and owned by them for 70 years, Sestriere is one of the earliest and still one of the highest purpose- built ski stations. Sitting on a sunny plateau, snow cover is guaranteed thanks to both altitude and one of the world’s most extensive snow making operations. Sestriere and Via Lattea ski resorts hosted the alpine events in the 2006 Turin Winter Olympics. Despite this honour Sestriere is an area best suited to intermediates on the piste. Some great advanced piste exists but it is not extensive. Challenging off-piste terrain is available for the adventurous and fresh snow can lay unsullied alongside piste runs for days. The Via Lattea gives Sestriere skiers access to nearly 400km of ski runs serviced by 70 lifts. Sestriere (2,035m) is the highest resort in the Milky Way. Here experts will enjoy the north-facing terrain and plenty of steep, snowsure slopes. Sestriere has the best snow record in the Milky Way. 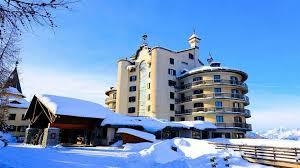 This beautiful ski in/ski out hotel on the edge of the village will be our host for the week. It is a short 15 minute walk into the town of Sestriere or you can take the complimentary hotel shuttle. All rooms provide mini bar, TV, hair drier and bathrobes. The hotel features two restaurants serving local and gourmet cuisine managed by a Michelin star chef. Our hotel package includes a rich buffet breakfast and multi course dinner daily as well as wine with dinner (one bottle per three people).